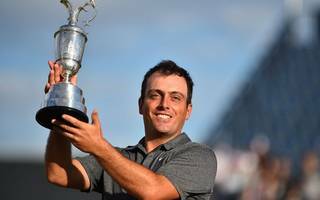 Just 10 weeks ago, there was no sign of the transformative turn that Francesco Molinari’s career was about to take. He had just missed the cut at The Players Championship and, having won only once in six years – on home soil at the 2016 Italian Open – had slipped outside of the world’s top 30. Since then Molinari has entered six events, winning three of them and finishing second in two of the others. *Read more*: Colin Montgomerie interview: "Competitiveness motivates me more than golf"
And following his flawless final round at Carnoustie today, in which he saw off some of golf’s biggest names to win The Open, he is now a Major winner. That sinking-in period might just be longer than the spell in which Molinari has gone from the quiet man on the sidelines to the most in-form player on the planet. He began his purple patch with victory at Wentworth in the BMW PGA Championship, where he had been runner-up 12 months earlier. He almost achieved back-to-back wins when second at the Italian Open the following week, before heading to the US Open, where he was tied for 25th. It proved the low point of his current sequence. In his next outing he won his first PGA Tour title, the Quicken Loans National, and followed it up with a another second place at the John Deere Classic. Molinari’s win was in keeping with his unassuming manner: 13 consecutive pars while contender after contender – including playing partner Woods, upon whom much of the attention was focused – dropped shots followed a by a birdie at 14 to take the outright lead. Even when Xander Schauffele joined him on seven under, the man from Turin did not lose his cool. He kept the pars ticking over before landing the knockout blow with a birdie at 18. Schauffele, who had recovered from dropping four shots in three holes before the turn, immediately bogeyed 17 to hand Molinari a two-shot advantage that would stay intact. “I was [calm and composed] as much as you can be. I was ready for it. It could happen or not happen but I knew what I needed to do,” Molinari added.